You may not modify, adapt, translate, reverse engineer, decompile, disassemble, or create derivative works based on the licensed font itself without Paragraph’s prior written consent. Paragraph may, from time to time, update the fonts. Upgrade pricing may apply. This Agreement is effective until terminated. This Agreement will terminate automatically without notice from Fontspring or Paragraph if you fail to comply with any provision contained herein. Upon termination, you must destroy the written materials, the fonts, and all copies of them, in part and in whole, including modified copies, if any. *Web fonts use is governed by the attached Fontspring @Font-Face License Addendum. 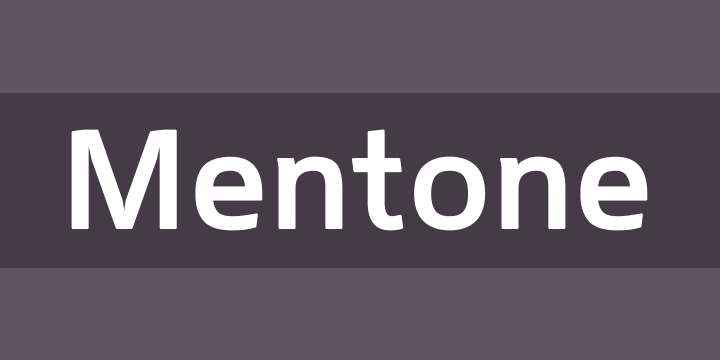 Mentone is a new general purpose typeface, an attempt at extending the line of the great sans-serifs of the previous century, Frutiger - Stone Sans - Myriad. The font has round corners and subtle chamfers, which are all but invisible at text sizes, but add an upbeat, irreverent expression at display sizes. The typeface is named after the beautiful bayside suburb of Melbourne, Australia, where the designer lives.